Don’t miss these crucial measures when you’re designing your ad testing survey. Before you spend thousands and thousands on a media campaign, you should test your ads in a controlled environment to ensure they have the desired impact. 1. Is There Anything Confusing, Unclear or Difficult to Understand About The Ad? Ask at least one question that explores shortcomings with your ad, letting the respondent know you’re actively interested in any criticism they might have. This breaks down any reluctance to be negative and sets the tone for a constructive and honest survey response. Try offering these options (confused, unclear, didn’t understand) with radio buttons. If the respondent answers ‘yes’ to any of them, follow up with an open-ended response field where they can elaborate on which part of the ad made them feel that way. 2. How Likely Are They to Recommend The Product To a Friend Based on This Ad? Because social proof is so powerful, recommendations are a strong indicator of perceived product quality. If someone would be willing to advocate your product to a friend, it’s likely they think it will create a positive result not just for the friend, but for the friendship itself. When a recommendation is made, values like trust and reciprocity are being staked on your product, albeit in a minor way. Use a Very Likely – Very Unlikely scale to measure responses to this question. Including at least one open text field is a bit like adding a safety net so you can catch anything important that’s fallen through gaps in your survey design. 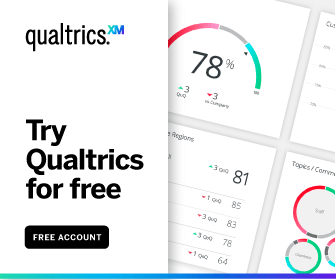 In the Qualtrics survey platform, you can choose between different open field text box sizes, from one-line fields that encourage a quick, succinct response, to larger essay-style boxes for when there is more to say.